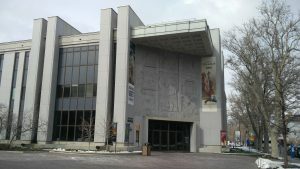 FamilySearch International announced today that David Rencher, AG® , CG®, FIGRS, is the new director of the popular Family History Library in downtown Salt Lake City, Utah. He succeeds Diane Loosle, who is fulfilling other leadership needs. Rencher will continue to serve as FamilySearch’s Chief Genealogy Officer. The library is open to the public free of charge. This is not Rencher’s first time at the helm of the Family History Library, which opened at its current location in 1985 and serves hundreds of thousands of guests yearly. He was the director from 1999 to 2002. Interestingly, Rencher’s career in family history started 40 years ago as an Irish reference consultant at the library. His return to the library at this time allows the previous library director, Diane Loosle, to fill a growing need in FamilySearch’s business development, where the two will work together. Rencher believes that his combined responsibilities as the CGO and library director will enable him to successfully work with FamilySearch development teams to expand the personal successes of patrons from differing cultural backgrounds worldwide. He says his expanded responsibilities will also include regional FamilySearch centers and guest experiences in over 5,000 family history centers globally. Speaking of future plans, Rencher iterated that the library will be the flagship of FamilySearch’s family history in-person experience for guests of all ages and skill levels. “Discovery experiences that have been proven in the library will extend quickly to FamilySearch’s family history center network, website, and mobile apps,” he added.